The holidays are officially upon us! If you're planning on shipping gifts or anything else, we have a few pointers for you to keep in mind when you go to the post office to ship your packages. Do your holiday shipping early! Do you want your package delivered by December 25th? The post office recommends that first class mail be sent no later than December 20th. If you're sending postcards or holiday cards, that's your absolute drop-dead mailing date. The parcel post mailing deadline is December 15th, so if you're mailing packages that don't fit into the flat rate Priority boxes, that's your deadline date. Get your shopping done, get your boxes packed and get to the post office! One of the best shipping deals around right now is the U.S. Postal Service's flat-rate priority shipping. Whatever you can fit into the box (provided at no extra charge by the USPS) will ship in the U.S., no matter how much it weighs. Your postman will even deliver the boxes to your door AND the USPS will pick up the package. The largest box measures 12"x12"x5-1/2" and ships anywhere in the U.S. for $14.50, or to APO/FPO addresses for only $12.50. The medium-size box is 11" x 8-1/2" x 5-1/2" and only costs $10.70 to ship anywhere in the United States. The small flat rate box is 8-5/8" x 5-3/8" x 1-5/8" and ships for a mere $4.95! I recently filled a large Priority box with books; it would've cost me a lot more to ship by weight, even with the media mail rate, so keep these flat-rate shipping boxes in mind when you're shipping packages for the holiday. The later you ship, the more it will cost you, in both time and money. Other delivery services have later ship dates than the United States Postal Service, but you will pay more. And regardless of what service you use, you will be standing in a line if you wait, especially the last week or so before Christmas. Bottom line? 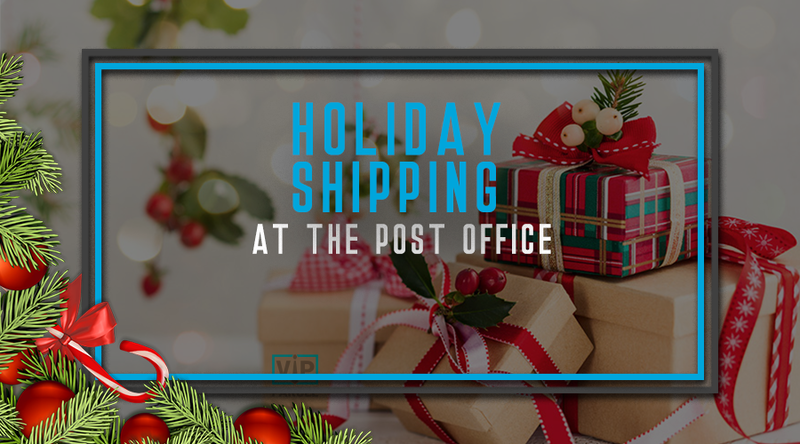 The post office is your best deal, but you need to get your shopping done and your packages sent sooner, rather than later! Whether you're shipping in a Priority box or doing your own packing, pay special attention to how you're packing your boxes, especially if you have breakable or perishable items. It's worth the extra attention to make sure everything arrives in one piece. Consider a padded envelope, which you can then place inside a box for shipping. This is sometimes the cleanest and easiest way to protect what you're shipping. Styrofoam peanuts can be annoying (not to mention their impact on the environment). A padded envelope is essentially the same as bubble packing, but can be less expensive, depending on what you're shipping and how much you need. Everyone loves home-baked goodies for the holidays! They can send a message that means so much more than purchased gifts. However, there are some basics you need to know if you're sending goodies through the post office. Cakes don't travel well. Quick breads and yeast breads aren't recommended because they lose their freshness quickly. Fruitcake travels well because its taste improves with age, as the flavors mellow. Honest - homemade fruitcake is much better than the stuff you buy through mail order or at the store. Fudge and cookies make the best holiday mail gifts. Separate fudge with waxed paper and over-wrap, first with plastic and then with foil. Large cookies or cookies that have been decorated should be placed back-to-back and wrapped in pairs. Metal containers are excellent because they help retain moisture. Clean coffee cans or recycled cookie tins from purchased cookies work great. You can also get tins at most dollar stores. Cover the bottom of the container and each layer of cookies with crumpled paper towels or waxed paper and seal the container with tape. In other words - package to send in much the same way the commercial cookie makers do. What works for them will also work for you! Holidays are a special time with friends and family. Your loved ones who live far away will enjoy your gifts!